Greenberg Traurig acted for several high-profile individuals over the past year, including a UBS trader who was acquitted of spoofing charges, and a South American football association’s former president, who received a nine-year jail sentence for racketeering, wire fraud and money laundering. Founded in Miami 50 years ago, Greenberg Traurig’s white-collar practice took off in 1989 when veteran attorney Mark Schnapp joined the firm from the US Attorney’s Office for the Southern District of Florida. Schnapp, a Who’s Who Legal: Business Crime Defence nominee, served as co-chair of the firm’s global white-collar practice in Miami until 2016. He remains a shareholder at Greenberg Traurig, the equivalent of a partner. Schnapp was succeeded by Marc Mukasey, who joined the firm’s New York office in February 2016 from Bracewell, where he headed the white-collar defence practice. Previously, he served at the US Attorney’s Office for the Southern District of New York for eight years. John Pappalardo, a former US attorney for the District of Massachusetts who works from the firm’s Boston office, is the other white-collar practice co-chair. In the New York office is shareholder Daniel Filor, also a former Southern District prosecutor, and Obiamaka Madubuko, who regularly advises US-based companies on compliance with the UK Bribery Act and the FCPA. In Washington, DC, the firm boasts former DOJ trial lawyer Pamela Marple and Elaine Greenberg, who was a senior officer in the SEC’s enforcement division and also associate director of the SEC’s Philadelphia regional office over a 25-year career at the agency. The firm has made a push into the London investigations market, with the hire of Barry Vitou from Pinsent Masons. Vitou joined in May as head of London white-collar and investigations. He now works alongside shareholder Lisa Navarro, who advises companies on anti-corruption compliance measures with a focus on the requirements of the UK Bribery Act. At the time of writing, Vitou’s former colleague Anne-Marie Ottaway was rumoured to be joining him at Greenberg. In Shanghai, co-managing shareholder George Qi focuses his practice on internal investigations into regulatory violations, including the FCPA. The firm’s Mexico City office is home to Hugo López Coll, a 40 under 40 nominee in 2017, who advises clients on regulatory and compliance matters, including potential FCPA violations. Coll and Vitou are both listed in Who’s Who Legal: Investigations, while Vitou, Schnapp and Gregory Kehoe are listed in Who’s Who Legal: Business Crime Defence. The firm lost Rudy Giuliani in May 2018. The former Mayor of New York had taken leave from the firm in April to represent US President Donald Trump in the US Special Counsel’s investigation into Russian interference in the 2016 election, and any related matters. Giuliani had joined the firm in 2016. Pappalardo advised South American football association Conmebol’s former president, Juan Ángel Napout, who received a nine-year jail sentence in August 2018 after being found guilty of racketeering, wire fraud and money-laundering charges over claims he accepted bribes linked to the sale of marketing rights for football tournaments. The firm acted for former UBS trader Andre Flotron, who was acquitted in April of conspiracy to commit commodities fraud. Specifically, Flotron was accused of “spoofing” – the practice where a trader attempts to inflate the price of futures contracts for certain commodities by feigning to make orders but not following through. The acting chief of the DOJ’s fraud section, Sandra Moser, described the decision as a “tough loss”. Giuliani, when he was at the firm, was among several prominent defence lawyers representing Turkish-Iranian gold trader Reza Zarrab, who was charged in connection with a scheme to violate US sanctions on Iran. Zarrab pleaded guilty in November 2017 and agreed to become a cooperating witness. Giuliani disclosed in court filings that he and another of Zarrab’s defence lawyers, Michael Mukasey, had travelled to Turkey to try and broker an agreement between the US and Turkey to resolve the case. Greenberg Traurig’s investigations lawyers are based in 13 of the firm’s 29 US offices including Boston, Chicago, Miami and New York. Other white-collar shareholders are based in London, Mexico City and Shanghai. The firm has represented a range of high-profile individuals and corporates in white-collar investigations, including Japanese car part supplier Takata, gold trader Reza Zarrab, former Fifa official Juan Ángel Napout and former UBS trader Andre Flotron. Other corporate clients include healthcare companies Wellcare Health Plans and Exactech, as well as Duke Energy and firearms manufacturer Smith & Wesson. In 2016, lawyers at the firm were part of the team representing ex-Countrywide executive Rebecca Mairone Steele. Federal prosecutors had pursued both Bank of America and Mairone Steele over the sale of faulty loans, but an appeal courts overturned penalties against both. In the FCPA space, Greenberg Traurig is well known for representing engineering company Atkins North America in its investigation by the SEC and DOJ. The joint investigation into the Atkins’ bids on contracts in Qatar and Morocco resulted in a declination from the DOJ and the SEC’s second-ever FCPA deferred prosecution agreement in January 2015. The firm also advised Smith & Wesson in its 2014 settlement with the SEC, which arose from the 2010 Africa sting operation that targeted 22 employees of various military contractors. Mark Schnapp in 2015 helped Tampa-based engineering firm PBSJ Corp receive a declination from the DOJ, and a rare deferred prosecution agreement with the SEC, over FCPA allegations. Pappalardo has also acted for the former chairman of Russian oil company Yukos, Mikhail Khodorkovsky, on charges of fraud and tax evasion. He was sentenced to nine years in prison, before being released in 2013. 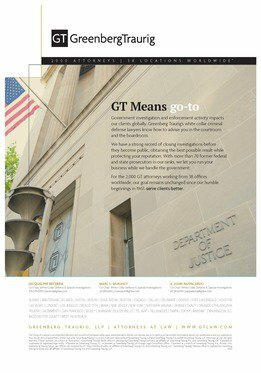 Greenberg Traurig’s white-collar defence & special investigations practice has more than 70 attorneys and the firm overall employs more than 200 former government officials, including many former prosecutors who have collectively tried hundreds of criminal cases. Armed with this experience, intimate knowledge of government processes, and an arsenal of global resources, we tackle criminal, regulatory and other mission-critical investigations worldwide arising out of the unforgiving surveillance that businesses and individuals face today. Our team defends Fortune 500 companies, boards of directors, special committees, funds and executives at hearings and trials related to alleged money laundering, fraud, environmental crimes, public corruption, campaign finance violations, immigration and visa infractions, and tax evasion. The group is currently representing individuals in relation to the ongoing investigation by special counsel Robert Mueller’s team into alleged Russian tampering with the 2016 presidential election. We also handle internal investigations and advise on compliance issues. This includes serving as global lead anti-corruption counsel for Walmart. We secured an acquittal in US v Flotron, a federal criminal case tried in the District of Connecticut in April 2018. Andre Flotron, a former precious metals trader at UBS, was charged with manipulating prices of precious metals futures contracts through a practice known as spoofing, which involves entering large orders onto an exchange – for the alleged purpose of artificially moving the market price of a commodity – and then quickly cancelling those orders before they are executed. Our team obtained dismissal of six counts before trial, and on the remaining conspiracy count secured the first-ever jury acquittal in a spoofing trial. Facing up to 25 years in prison, Flotron became the first spoofing defendant to successfully defeat the US Department of Justice. With this victory, Greenberg Traurig drew the roadmap for other spoofing defendants around the country and dealt the government a significant setback in its prosecution of these cases. Our team also serves as lead trial counsel for Michael Gramins, a former bond trader at Nomura Securities International Inc, in a high-profile residential mortgage-backed securities (RMBS) matter that alleged Gramins lied to customers about mortgage bond prices. The case followed the same theory as US v Litvak, and had nationwide implications for RMBS markets. In a long and contentious federal criminal trial before Judge Robert Chatigny in the District of Connecticut, our team again outdueled the government. The jury failed to convict Gramins on eight of nine counts, including six counts on which he was outright acquitted. (USvShapiro et al). Thereafter, in post-trial motion practice, we successfully argued that the same reasoning for the court’s reversal of Litvak’s conviction (that the trial judge erred in allowing misleading testimony regarding whether a duty of trust existed) should apply to the Gramins case. The lone count of conviction was thrown out by the court and Gramins was granted a new trial. Our attorneys also defend criminal matters in jurisdictions around the world, including those related to the Foreign Corrupt Practices Act (FCPA), the UK Bribery Act, and related anti-corruption laws, representing clients before international tribunals and regulators. We handle cross-border investigations concerning fraud, money laundering, insider trading, RICO, and global anti-corruption. In ongoing representations on five continents, we provide anti-corruption advice on compliance with US, UK and other foreign laws.